Wedding season is almost here, and wedding preparations are in full frenzy. Brides have so much to think about and plan—invitations, dresses, showers, cake, flowers, ceremony location, reception details, and on and on. The list seems endless! Even so, one vital element for making the day flawless often gets forgotten: deciding how to “manage” your future mother-in-law. This relationship, after all, may feel a bit awkward at first. Your fiancé’s mother is not your mother, and she’s also not really your friend, yet she’s about to become a big part of what you hope will be the rest of your life. As if that wasn’t stressful enough, you have, no doubt, heard all sorts of stories about what an absolute nightmare mothers-in-law can be. It doesn’t exactly tempt you to embrace this near stranger with wild abandon, does it? To make things even more challenging, no two mothers-in-law are alike. Each one comes with her own personality, demeanor, and style based on her life experiences, personal history, and yes, her own personal emotional baggage. To make both your wedding and your future life with your mother-in-law go as smoothly as possible, it helps to know more about the cards you’ve been dealt. With that in mind, below are descriptions of the four basic types of mothers-in-law. Figuring out which category she fits will go a long way toward helping you see the best way to handle any situation that arises with her—wedding or otherwise—so you can avoid stress or tension before it occurs. 1. Comfortable Carla: She has created a new identity for herself beyond that of “mother.” She is clear that her new role in her son’s life is secondary to his wife’s role. 3. Off-the-Wall Wanda: She comes across as mean, insensitive, and self-centered. Everything is about her and what she feels, wants and needs. Her behavior is often extreme. 2.Mothering Margaret: She struggles with letting go of her mom role. She wants everything to be the way it’s always been, even though circumstances are now different. She not only wants to continue to mother her son, but she also views her daughter-in-law as a “daughter,” which means she wants to mother her as well. 4. Uncertain Sara: She has let go of her son, but she is uncertain about her new role as a mother to an adult child and to a daughter-in-law. Sometimes she tries too hard, and sometimes she just misses the mark. Although sometimes these types can overlap a bit, chances are that one of them describes your future mother-in-law best. Once you identify which type she is, dealing with her won’t be nearly as difficult as you fear, because you can better understand her motivations, her issues, and her needs. Sometimes, just being able to “see behind the curtain” can diffuse the tension enough for you to feel a bit of compassion. After all, chances are that she is not sure how things are supposed to be either. The situation is just as new to her as it is to you. Even if she has other daughters-in-law, the relationship she has with you will be unique to the two of you. And trust me, if she ends up feeling like a fifth wheel during the wedding festivities, that is not going to serve you very well in the future. Decide what you will call her. Figuring out what you are comfortable calling your future mother-in-law may not seem like a big deal to you, but it’s a really big deal to her. Once you’ve made the decision, talk with her about your choice so she can get used to it. Let her wear it for a while. Give her a piece of the action. Let her be part of the preparations as well as the wedding itself. You can assign her major duties or small tasks, but be sure to give her something to do that she can feel good about that will ensure she won’t feel pushed aside or ignored. Ask her for input. Remember, this is her child’s wedding, too. You don’t have to let her make the most critical decisions, but asking for her opinion now and then is a gracious gesture that will make her feel valued. Invite her to join in the fun. If you’re having a “nail” day or other excursion that includes your mother and bridesmaids, consider asking your future mother-in-law to come along. You don’t have to ask her every time, but extending a few invitations assures her that you want her to be a part of your new life with her son. Share with her. Keep her updated on the wedding plans, and share some of the funny stories with her. Many mothers of the groom feel as though the wedding is happening around them, with them being merely passive observers instead of key players. Help her to have some special memories that she can share with her friends, too. Speak and act with kindness and compassion. Trust me, it never hurts to be gracious, and your efforts will go a long way toward ensuring that everyone lives happily ever after! 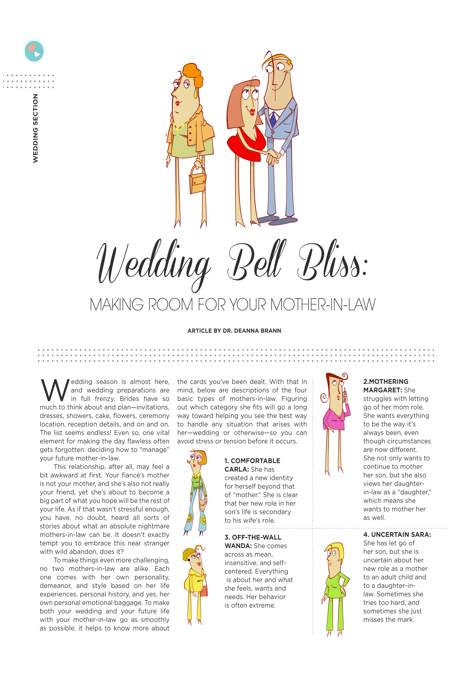 Deanna Brann, Ph.D., is a leading expert in the field of mother-in-law/daughter-in-law relationships. She has over 25 years’ experience as a clinical psychotherapist and ran her own private practice for more than 18 years. Based in Knoxville, Tenn., Dr. Brann is a sought after speaker, author and seminar leader. She is the two-time author of Reluctantly Related: Secrets To Getting Along With Your Mother-in-Law or Daughter-in-Law and Mothers-in-Law and Daughters-in-Law Say the Darndest Things. www.drdeannabrann.com.